Damn and blast both David Barr Kirtley and John Joseph Adams! These two rogues are the hosts of The Geek’s Guide To The Galaxy podcast. I have had good reason to curse them publicly. 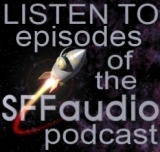 Their podcast is both a terrific listen week after week, and is often horning in on SFFaudio’s territory (by talking about audiobooks). I’ve held my tongue until this latest incident. These two hoseheads, Kirtley and Adams, have now gone too far! They’ve poached Dan Carlin as their guest for next week’s podcast. This is a scandalous thievery. We posted our plan to get Carlin a full 4 Hours and 44 minutes before they did! And so while I cannot possibly condone their unwarranted guest poaching, I cannot also, in good conscience, deny their podcast’s high quality. Thus it is with disgust I must hold my nose and recommend you subscribe to The Geek’s Guide To The Galaxy podcast. But also let it be know, across the internet, that The Geek’s Guide To The Galaxy is formally ON NOTICE as of right now. You’d better not wander into any dark alleys Kirtley/Adams. Love your show, David and John!